Amazing, inspiring, uplifting, still gets me in a good mood every time I watch it, but there's a bit of extra imagination needed to correct a visual flaw near the end: while all the planets and stars are realistic renditions, what's the layman to think of the CMB scattering surface meant to depict our universe seen from outside, near the end? That it's mottled red-orange and blue? Anyone not familiar with cosmology would ask how that's possible when the scenes just before were whitish galaxies, and require 5 minutes of explanation when everything until then was immediately understandable. The multiverse is very cute. You just can't stop the video with just our universe dangling in there in its garish colors, and it clearly states that we're entering pure speculation at that point; you wonder what's between the universes, though (water?) And wasn't there one like that in the first Men in Black? I liked the video a lot, thank you. I also liked the multiverse ending. One suggestion, to improve the multiverse sequence, is to have other universes represented by odd, dynamic shapes with odd, dynamic connections between them. Explorers, geographic and scientific, seem to find new things which are stranger than what they expected. So if there is a multiverse, anticipating it with artistic license may be appropriate. Malcolm Lambert. Seems highly unlikely that stars such as Aldebaran and UY Scuti would have the large-scale lumpy texture as depicted in the video. Do large stars have such low surface gravity that these gigantic lumps can form? Or some really weird distribution of mass that produces odd-looking equipotential surfaces? I get artistic license and all, but the physics just doesn't make sense. My 5th grade teacher was a contestant on Queen for a Day but Dollar a Second was my favorite show. The sun's photosphere is sunspot lumpy and the sun's corona is highly irregular. Why wouldn't Aldebaran and UY Scuti have the large-scale lumpy texture as depicted in the video? 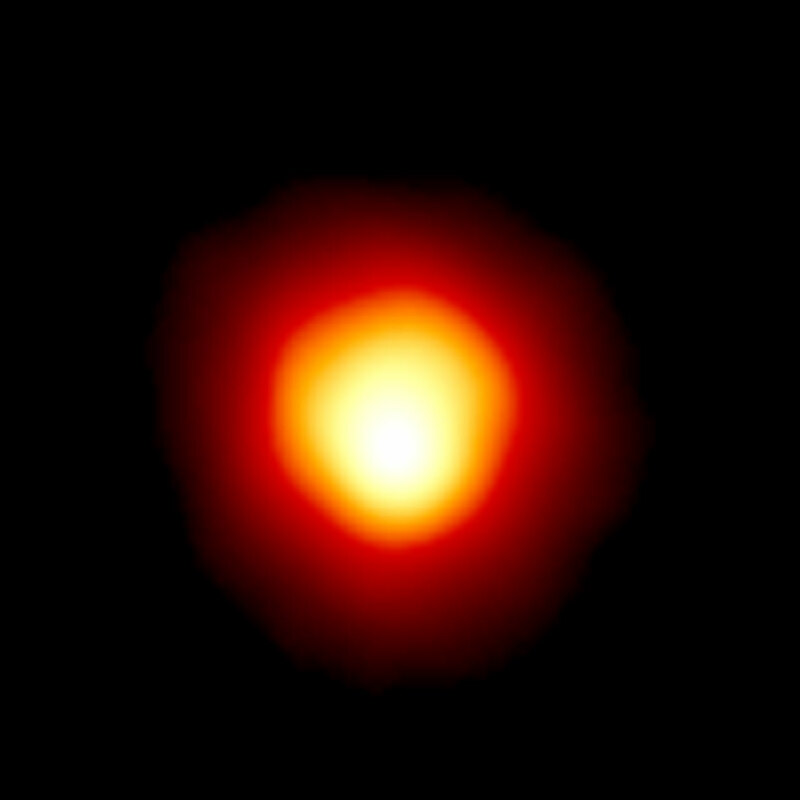 Here is a picture of Betelgeuse that shows it to be lumpy, or at least irregularly shaped. Red giants like Aldebaran, let alone red supergiants like Betelgeuse, have very hot and energetic cores and lumpy, bloated exteriors. That combination sounds like a good way to get irregular stars, particularly if the cores are "pumping irregularly", which I think is the case for red giants. - It treats the universe as being 90 billion light years in diameter. However, that is just the extent of the observable universe. The full extent of the universe (at this time) is unknown and must be much bigger. - It treats other universes as being disconnected from ours in a bigger space, when in truth other universes would be separated from ours in alternate dimensions in a hyper-spacetime. After all, the universe by definition is the full 4-dimensional spacetime continuum that we can be connected to through any kind of spacetime path (including spacelike paths which would even connect us to parts of the universe that are physically inaccessible to us). It's still a fine video, and it may be that introducing people to the concept of a multiverse is worthwhile. But the creator still bit off more than he knew how to chew with the multiverse business. - It treats the cosmic microwave background as being the outer boundary of the universe, when it truth it is close to the center of the universe. (I consider the "Big Bang" to be the center of the universe. Note that it is offset from us in time just the same way that the center of the Earth is offset from its surface by depth. while the "Big Bang" lies just outside the CMBR. Sort of, but really not. That's how we end up with misleading images like in the video, of some spherical CMB surface at the outer edge of the [observable] universe. The CMB isn't a structure like galaxies. It's just a soup of photons that permeates the Universe. At any given location, those photons were produced about 13.7 billion years ago. We could travel through space and get closer to other galaxies, rather like the video shows. No matter how much we travel, though, we can never get closer to the CMB. The current CMB is the plasma baby picture of a (45 Gly) distant structure (of the known universe) that is still out there in its evolved form and that could have been visited or viewed in the distant future if it weren't for dark energy expansion. There is absolutely nothing wrong with using the CMB baby picture to represent the distant structure itself until we have a sophisticated enough computer (Deep Thought?) to show us what it would actually look like today. The hot plasma CMB itself exists only in the past and would require a time machine to visit. The fact remains, this presentation is confusing. It gives the impression you could zoom out and see something like this. You could not. It's also confusing because the entire video is showing us what we could actually see with our eyes, and then the view silently and magically shifts to microwaves at the end. The final frames show something completely different from what the rest show. You are spatially (in 3 dimensions) at the center of the universe just the same as you at at the center of the surface of the Earth. Under general relativity the universe is a dynamic glome whose circumference is a function of coordinate time from and with respect to the Big Bang; with the circumference of the universe being zero at the Big Bang event. As the size of a sphere is a function of the distance from its center, that is why I (analogously) say that Big Bang is the center of the universe. Or to put it yet another way: I am talking spacetime and not just space. background presentation is presented as the border of our universe. APOD should not have let this video on their site. O.K. but for all you and I know 1) the universe is round spherical, 2) there are other universes scattered around as there are stars in our own galaxy (perhaps in super-duper galaxies in the super-duper universe, 3) the cosmic background plasma remnant from the BB is the border of our universe. These ideas may or not be wrong (and we'll likely never know) but that's beside the point. The point is that the video should have ended before the point of pure conjecture. In fact, we know beyond reasonable doubt, that the Universe is not spherical (because it is not a 3D structure), and that the CMB does not define a border to the Universe. These ideas are wrong, and we pretty much know that. You are, of course, at the center of your own personal universe. The Center of the Universe is in Tulsa, OK.